Every time I advance the warp, more of the lizard disappears. 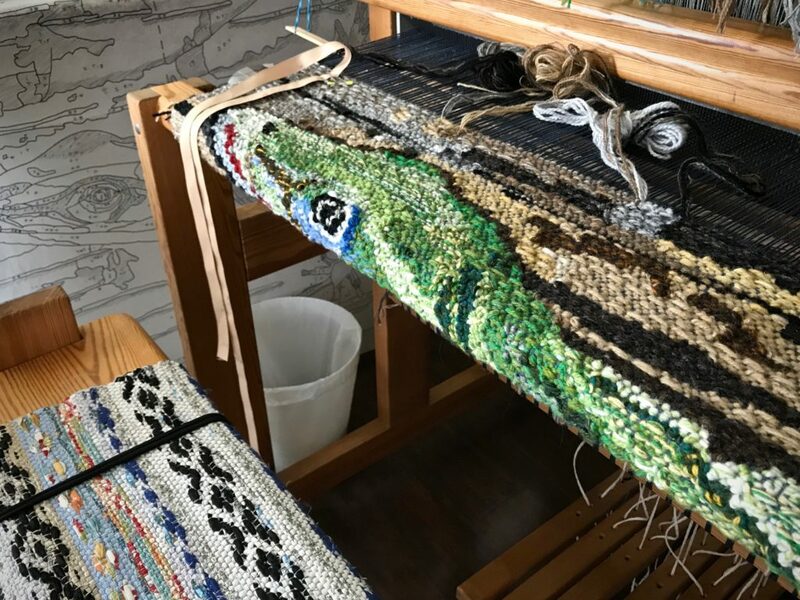 After I finish the tips of these toes, the rest of the weaving will be background—the log on which the green anole is perched. The lizard is more interesting to weave than the log. But without the background, the lizard itself would be incomplete. It’s all part of the journey. Every bit of the picture is needed to tell the full story. 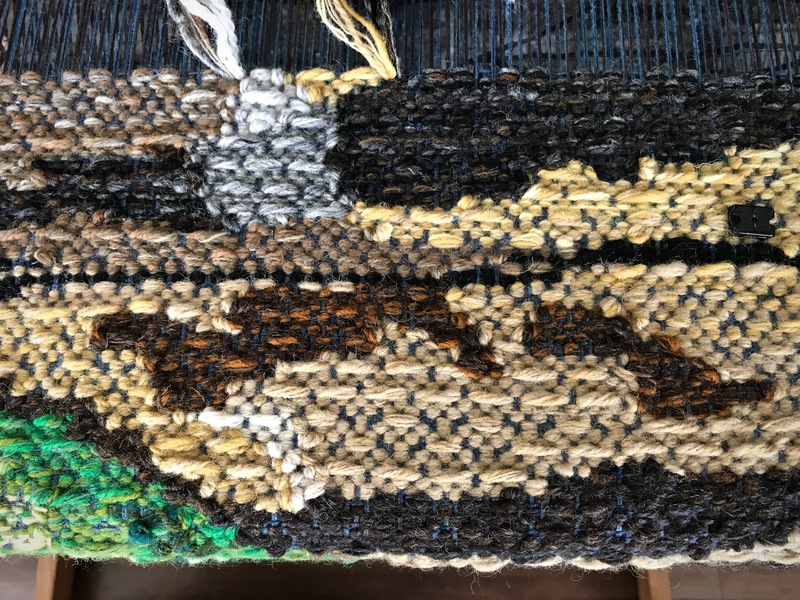 More than half of the tapestry is complete. Most of the lizard image is under the breast beam out of view. More of the lizard disappears every time I advance the warp. Only the tips of the lizard’s toes remain. After this, it is all background. Log detail. I am enjoying the many opportunities for color blending and shading in the background portion of the picture. Journey. We are on a journey. We see the scenery changing as we move from one point to another in our seasons of life. There’s the main focus, plus the background. All of which tells our story. 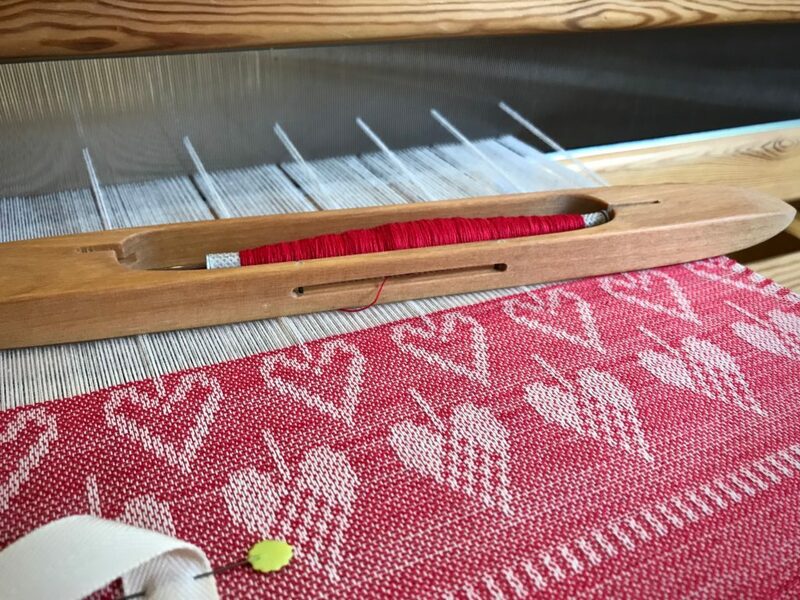 Knowing that we never see the whole tapestry while it’s on the loom, let’s ask God to watch over our journey. As a request, not a demand. And then, express gratitude with joy as we see that we’ve indeed been granted safe passage. May your journey be joyful. I really like all the texture you’re adding. This is going to be fabulous and I can’t wait to see it complete. I love your little saying at the end of each of your posts. Really makes me think We are all on our own journeys some good and sometimes bad but we do weave our own tapestries. Hugs and thanks for sharing your adventures. Hi Laura, Thinking is good for us, isn’t it? 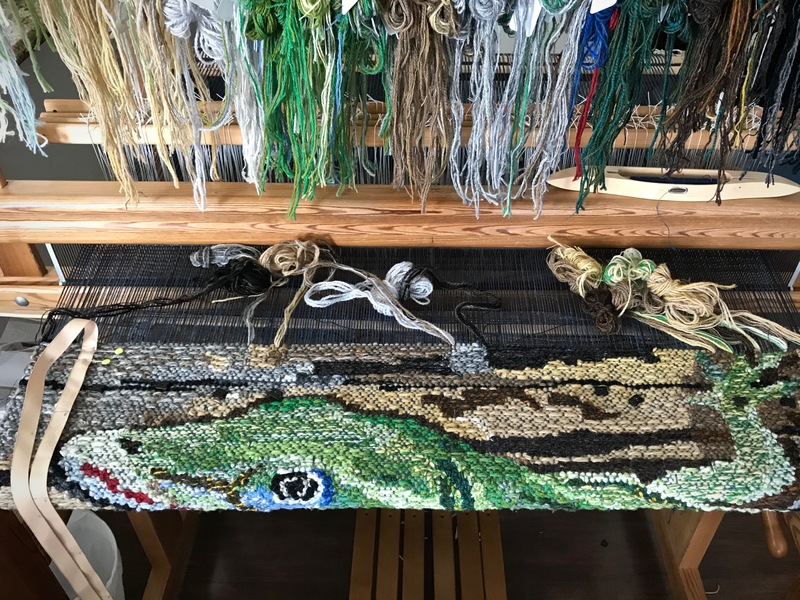 Our life tapestries are very personal, but it’s sweet when we get to share a bit of each other’s journeys. 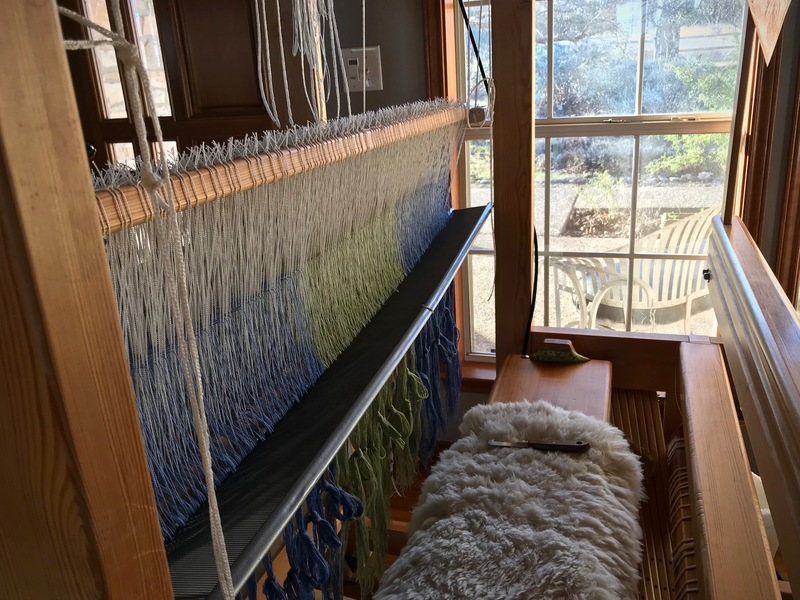 Even when we can not remember all the details of our past tapestry, parts that are already rolled on the back beam, God does. Hi Linda, Good point! There are some things of our own history that we will never know or understand until the tapestry is unrolled. 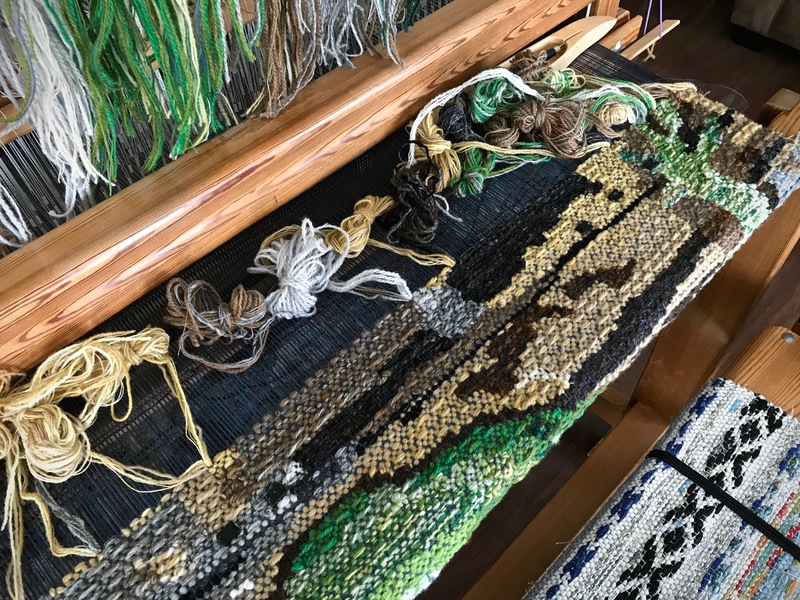 All lovely—both the weaving and the positive outlook on life s events! Thank you for sharing so openly! He is waving goodbye! See you in a bit! Looking forward to seeing all of this lizard. So many beautiful parts. The first of my Christmas promise gifts is now complete. This large throw in vivid colors fills the request from my daughter-in-law Marie. How fitting for a mother of three exuberant little boys to wrap up on the couch in her own fabric hug of exuberant color! 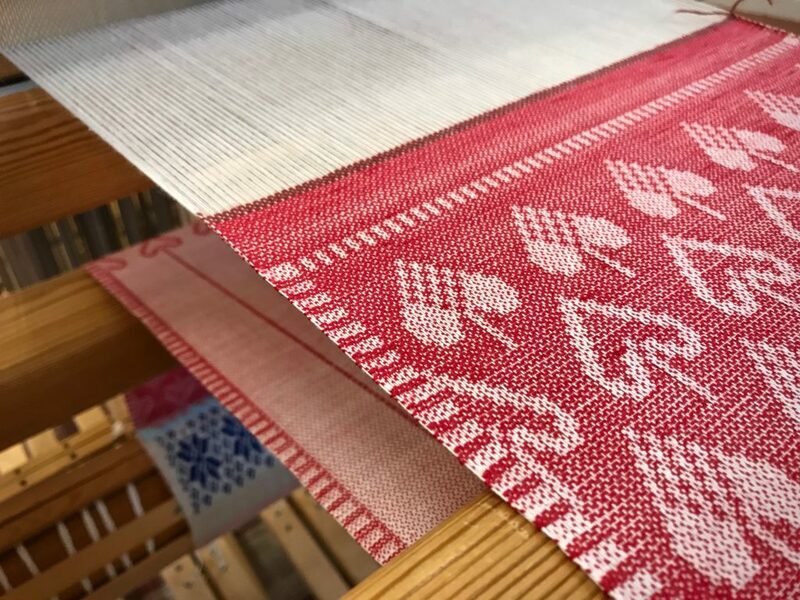 This colorful cotton double weave throw is Woven Radiance. Radiance. 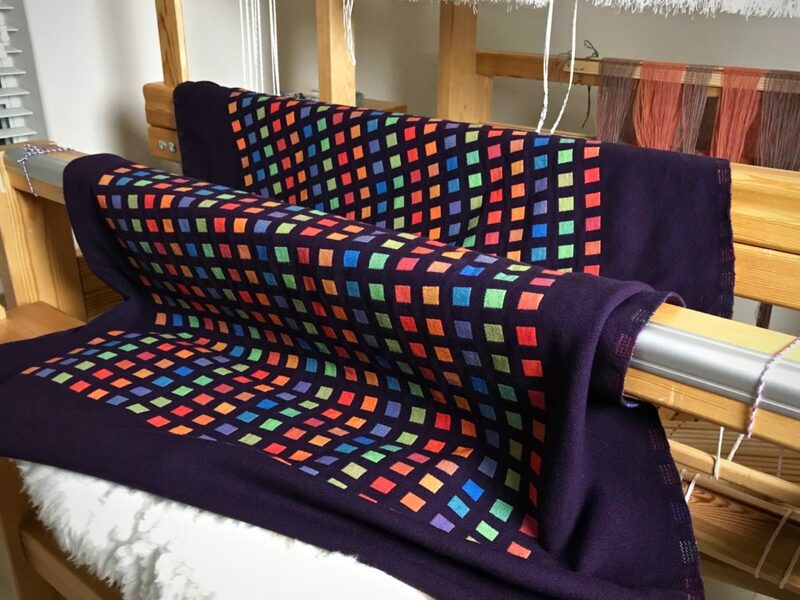 Large cotton throw with radiant blocks of color. 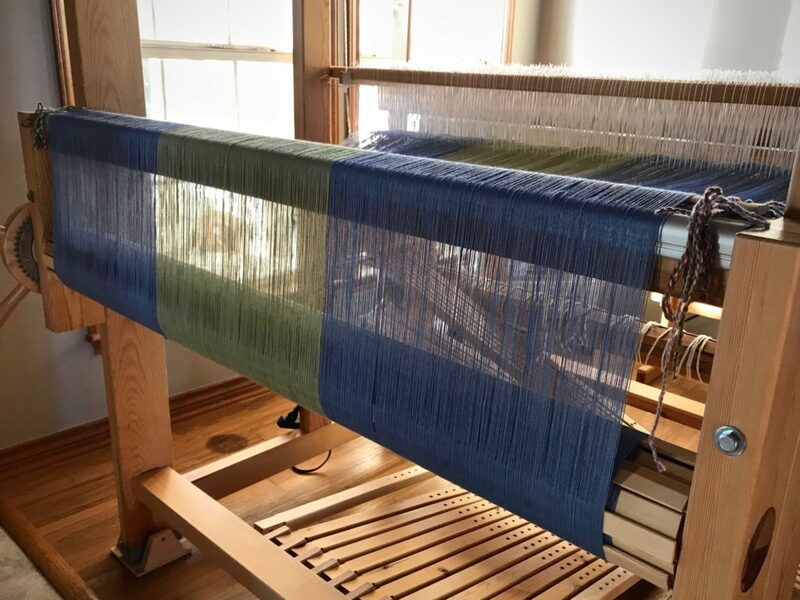 The warp for the next Christmas promise gift is wound and waiting on the warp beam. 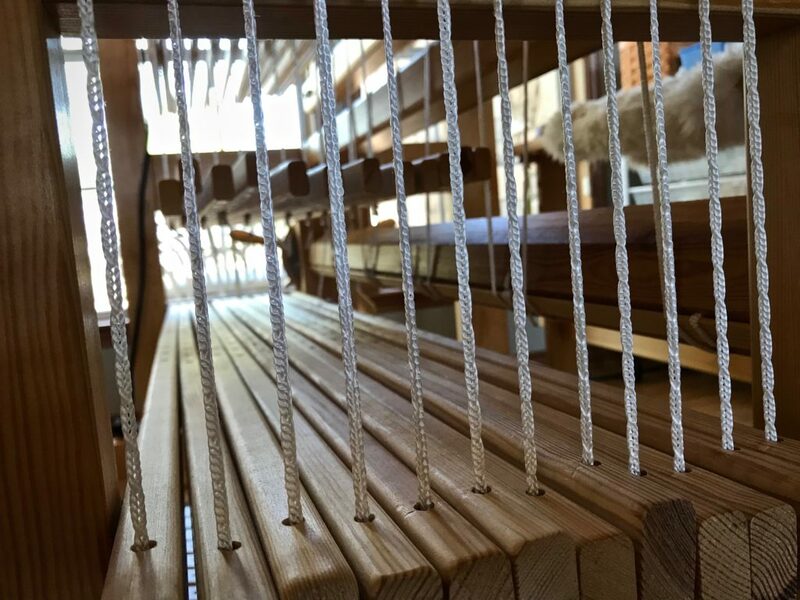 Double weave, with eight shafts and eight treadles, and 2,064 ends, is a challenge. But results like this make all the effort worthwhile. 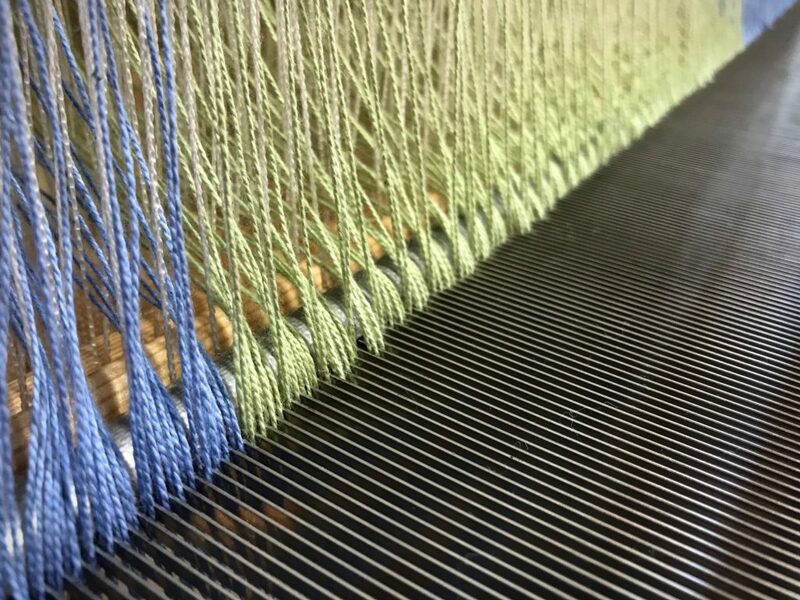 My heart sings as I see these brilliant threads intersect to make sensational cloth! 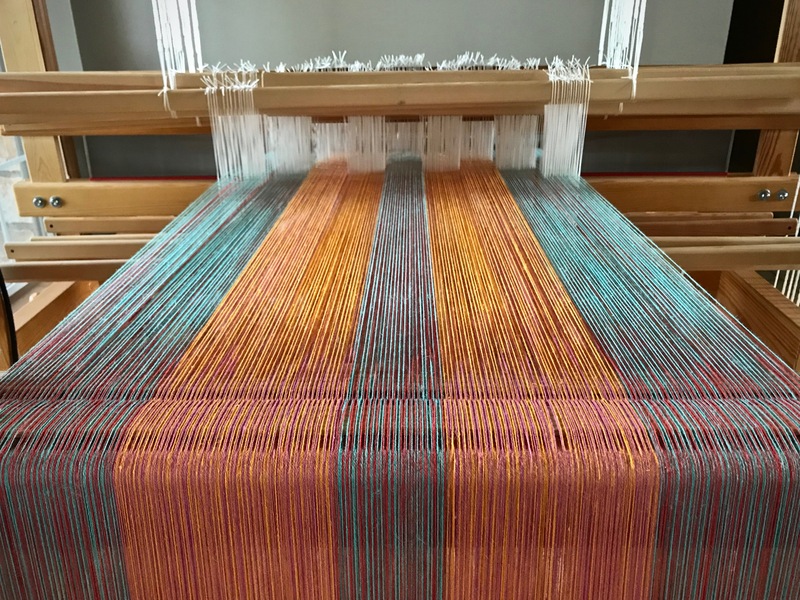 I am filled with amazement and gratitude that I’ve been given the opportunity to play with colorful threads on a weaving loom. I hope you enjoy the process photos in this little slideshow video I created for you. It’s just beautiful, Karen! What an heirloom. Good morning Beth, Hmm, I wonder if you’ve just stumbled onto the meaning of the word “heir”-“loom”? Lovely. 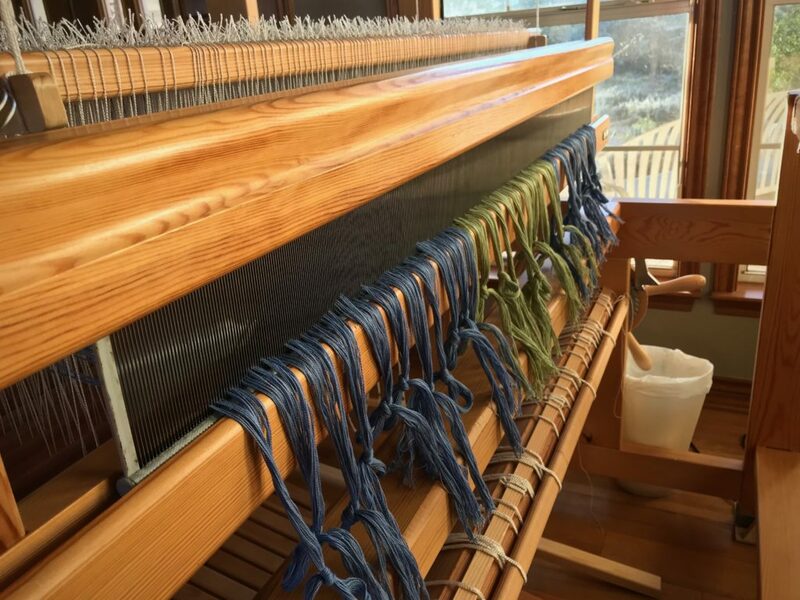 What cottons were used in the warp and weft? Hi Judy, This uses Bockens 8/2 cotton in the warp and weft. I like the name you chose. It will bring a radiant smile to everyone who sees it. Thanks, Barbara, your brainstorming with me really helped! Just stunning, Karen. I love your posts. Hi Barbara, That’s so kind of you to say. I’m glad you’re here! This is beautiful. What a lovely gift. Hi Leigh, A lovely gift for a lovely lady. She’s worth it! Wowza! What a beautiful throw!!! Hi Cindy, Your enthusiasm is contagious! Thanks so much! This is just lovely! And will be a hug from you each time it is used. 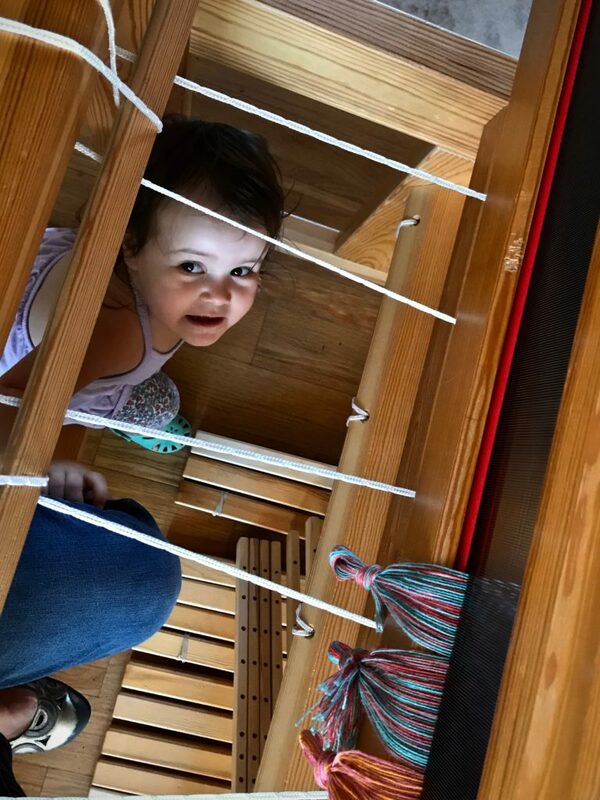 Hi Ellen, I agree, there is something about a warped loom that elicits joy. 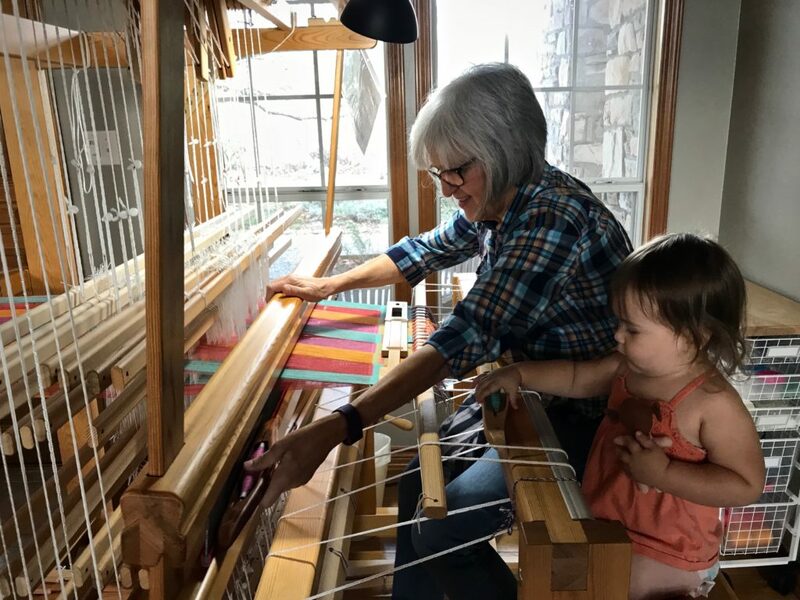 We weavers just can’t help but be happy next to a loom. Wow!!! Gorgeous!!!! Wish I was on your Christmas list, lol!!!! 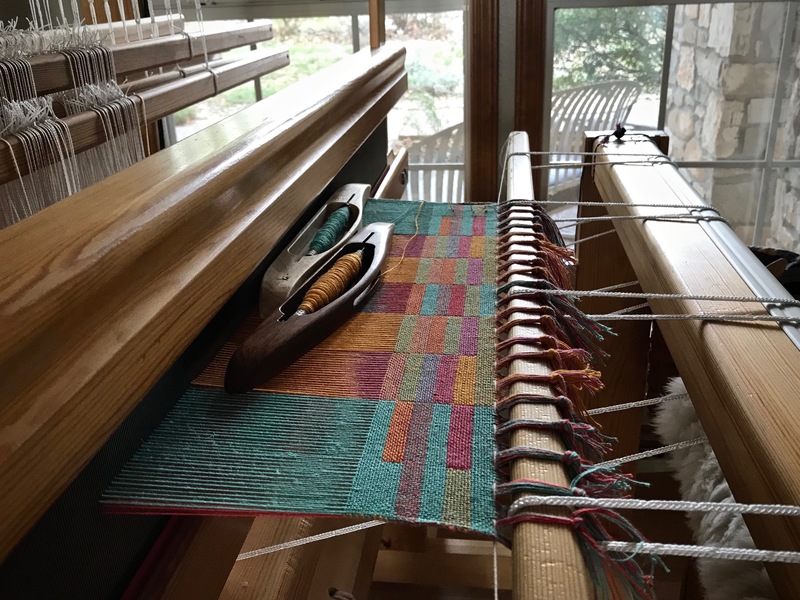 Hi Cindie, It’s been fun to weave something special for such a special person. This is just amazing! 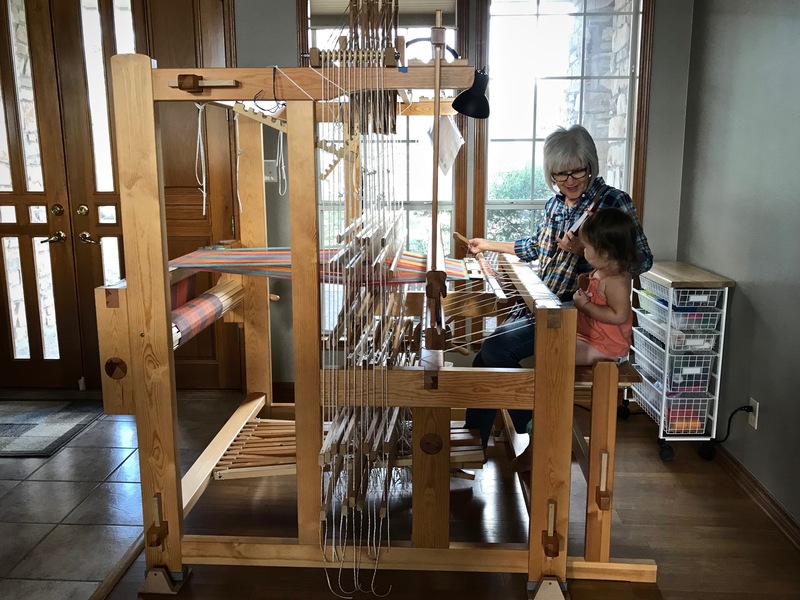 As a new weaver, this is so inspiring and makes me feel so enthusiastic about weaving. My goal is to make blankets for each of my family members. 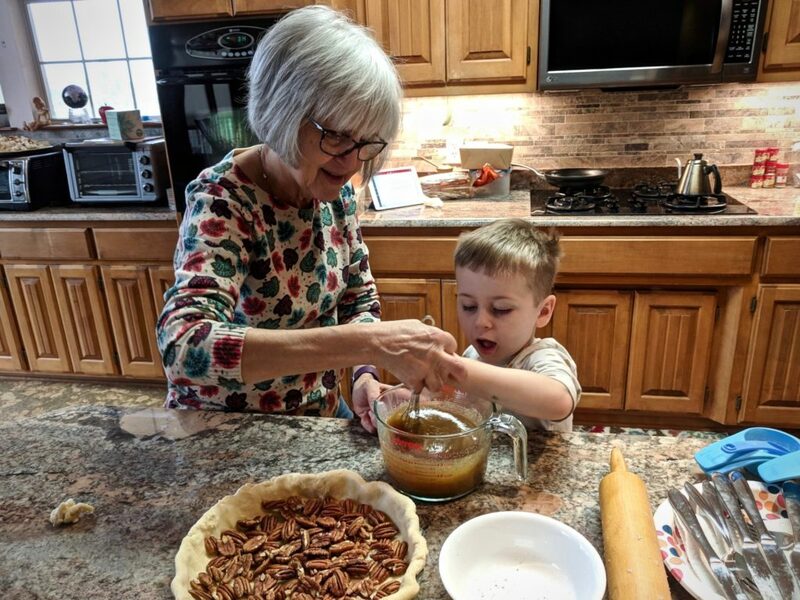 A few years ago I gave each of my grandchildren soft blankets (NOT hand-woven) for Christmas and they literally call them ‘grammy hugs’, as in, ‘where’s my grammy hug’. It would be so much better if they were handmade! The video was fun to watch-no cello music? 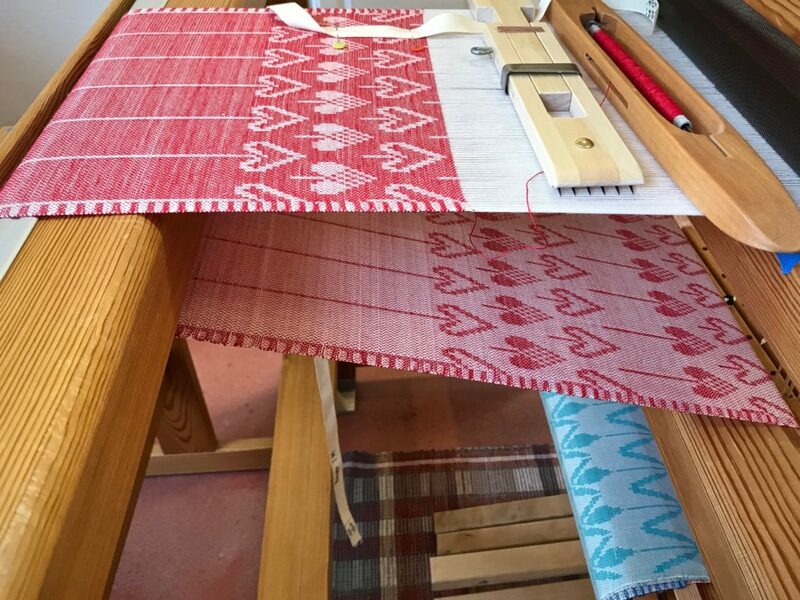 Hi Sheryl, I am so happy you feel enthusiastic about weaving! There is so much to enjoy in this field. 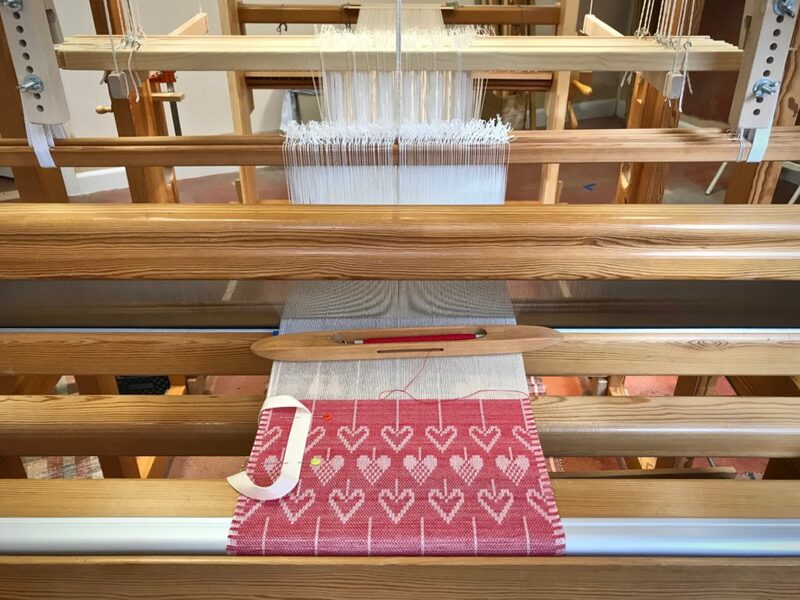 What a wonderful goal – to make blankets for your loved ones! You can do it!!! I so appreciate your kind thoughts! The entire package of textile artist, craftsman and teacher — fluent in electronic communication. It was nice to see your interns working on the blanket. Yet, where they wove and you wove were indistinguishable. They learned well. Hi Nannette, It’s thrilling for me to see my young interns weave on the “real thing.” They enjoyed it, too. Your words of encouragement mean so much to me! It’s beautiful, Karen! You do such exquisite work! Looking forward to seeing and touching it. Hi D’Anne, Thanks so much! I hope to bring it to the next WOW meeting.